Though technology is improving and the power requirements for our mobile devices are slowly becoming more reasonable, we still don't see many gadgets that can go more than a day without being plugged in. 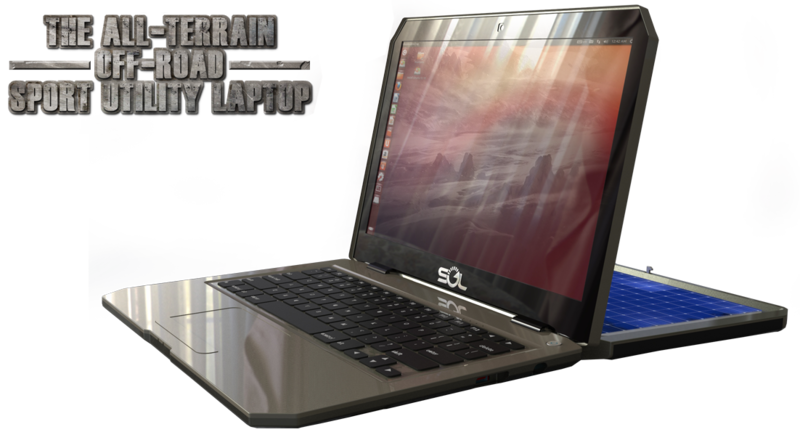 WeWi is trying to change that with their new rugged laptop line. The Sol is possibly the world's first fully solar powered laptop. With 4 solar panels that fold out of the device, the Sol can be fully recharged in as little as 2 hours. It has also been built to be efficient, and offers up to 10 hours of battery life once charged. The new laptop features a 13.3-inch 1366 x 768 LCD display, an Intel Atom D2500 1.86 GHz dual-core processor with integrated Intel GMA3600 Graphics, 2-4 GB RAM, a 320 GB HDD, a 3 MP camera, 3 USB 2.0 ports, an HDMI port, a multi-format card slot, wifi, Bluetooth 4.0, GPS, and is compatible with both 3G and 4G (with multimode LTE). With the goal of keeping the price down and making the Sol more viable in developing nations, WeWi has chosen Ubuntu as the operating system and will ship the laptop with free productivity software pre-installed. The less demanding OS should also help the Atom processor perform better than it would in a Windows device (such as a netbook). While an official launch date has not yet been set, tentative prices start at US$350 for the Sol, and US$400 for the Sol Marine submersible variant.